This is my contribution to this month’s Sugar High Friday event, hosted by Seven Spoons. The theme for this month is Neutral Territory: Tasting the Many Shades of White, and I anticipate many beautiful and elegant white desserts in the round-up coming later this week. Biscotti is my favorite kind of cookie, but it’s been a while since I made them, so the boys were very excited that we were going to make cookies this week. They helped pat the dough into the log shape and dip the cookies into the chocolate, then they hung out at the table while I took some photos. My oldest was interested in the way the cookies were arranged on the plate and he dubbed them “cookie toes.” I don’t know what on earth compelled him to come up with that name, but please be assured that they do not taste at all like toes! The base for these cookies is my almond biscotti recipe with macadamia nuts instead of almonds. I added the orange zest on a whim, thinking that the citrus flavor would pair well with the macadamia nuts, and I like how it turned out. The orange flavor is subtle but makes a nice addition to the cookie. 1. Preheat oven to 350° F and place rack in the middle of the oven. 2. Spread the nuts on a baking sheet and toast them in oven until lightly golden. Let cool. Coarsely chop half the nuts. 3. In bowl of stand mixer, combine flour, sugar, salt and baking soda. 4. Beat in eggs, then stir in the whole and chopped nuts. Mix to obtain a firm dough. NOTE: Dough should be sticky, but should not appear wet. You can add a little extra flour if necessary, but only a tablespoon at a time. 5. On a floured work surface, knead the dough briefly, then divide it into 2 pieces. Roll each piece under your hands into a cylinder 15 inches long and about 1-1/2 inches in diameter. Place the rolls, well separated, on baking sheet and bake 20 to 25 minutes, until very lightly browned and firm to the touch. The dough will spread a bit during baking. 6. With a spatula, carefully transfer the rolls to a cutting board and slice each one diagonally about 1/2-inch thick. Remove the parchment paper and set the wire rack on the baking sheet, and then lay out the biscotti on the rack. Return to the oven for 20 to 25 minutes, or until very firm and crisp. 7. Cool on the rack, then dip the ends of the biscotti into the melted chocolate. Lay them on a piece of parchment or wax paper and allow the chocolate to firm up. Store in an airtight container. Sounds yummy. Sadly I don’t think I’ve had biscotti. Your biscotti really caught my eye! It looks fantastic, I can’t wait to give it a try! Jerry: Biscotti are really easy to make, and they are great dunking cookings (coffee, tea, milk, chai…). Dayna: Thanks! I’m sure you can veganize these by using an egg replacer, but I haven’t tried that. Let me know how they work for you! This looks so good. 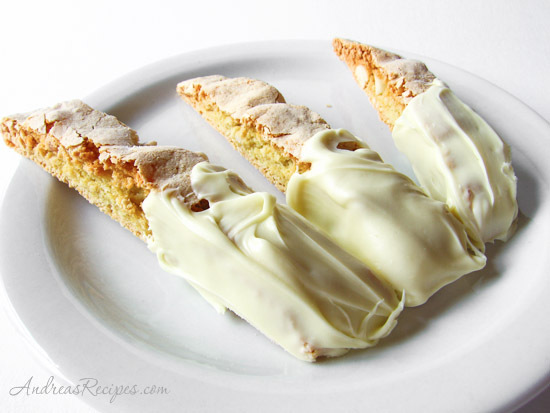 I haven’t made biscotti in a while and will have to do it soon! My mother and I were just reminicing over our love of biscotti last night. I will have to show her these! Thank you so much for taking the time to be a part of this month’s SHF! Mmmm, that looks truly decadent. I don’t think I could be able for the white chocolate to dry to pop one of these in my mouth….yum! I visited to read about your Cranberry Pistachio Biscotti and then I spied this picture and recipe. Man, oh, man…decisions… 🙂 I love making biscotti as well. They make a great gift for coffee drinkers too!